On Saturday, October 20th, 2018, the Dewey and Julia Souder Family was recognized by the Huntington County Honors group. Huntington County Honors states that as its mission, it “recognizes and celebrates those, past and present, whose achievements have enhanced life in Huntington County, our Nation, and our World.” Candidates of the Honors designation must have made a lasting contribution to the betterment of Huntington County. There were five inductee categories, including the “Business & Professional” nominees, for which the Souder family was honored. Long-time employee, Barbara Souder, wife of the late Philip Souder, and David Souder, their son and current CEO of Heritage Pointe Communities, were present to accept the award on behalf of the family. The nominees, Dewey and Julia Souder, were appointed by the Board of Trustees of the Methodist Memorial Home for the Aged in 1937. Dewey and Julia moved to Warren, Indiana, from pastoring a Methodist Church in Roanoke, Indiana, to be the Administrators of the Methodist Home. Dr. Souder served as the Administrator for 28 years, followed by his son, Philip E. Souder, who took over full leadership responsibilities in 1965. Philip and Barbara continued to serve the community together for over thirty years. The current United Methodist Memorial Home CEO is David P. Souder, Philip and Barbara’s son, who has served in that capacity since 1993. The United Methodist Memorial Home was founded on the philosophy of helping senior citizens fully enjoy their retirement years, a philosophy of fostering friendship, belonging, security and dignity by respecting individual privacy and independence while offering professional and thoughtful medical care and guidance. The United Methodist Memorial Home owns and operates Heritage Pointe of Warren, Heritage Pointe of Huntington and Heritage Pointe of Fort Wayne with 750 employees serving more than 900 residents at the three locations. 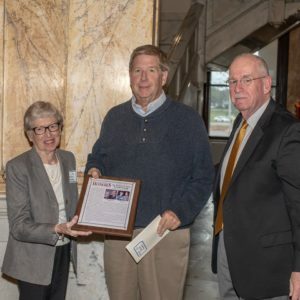 On behalf of Heritage Pointe Communities, we would like to thank Huntington County Honors for recognizing the Souder family and their contributions to Huntington County through several generations. May their examples continue to be our model as we serve residents of today and the future with the same ideals the United Methodist Memorial Home was founded upon more than 100 years ago.